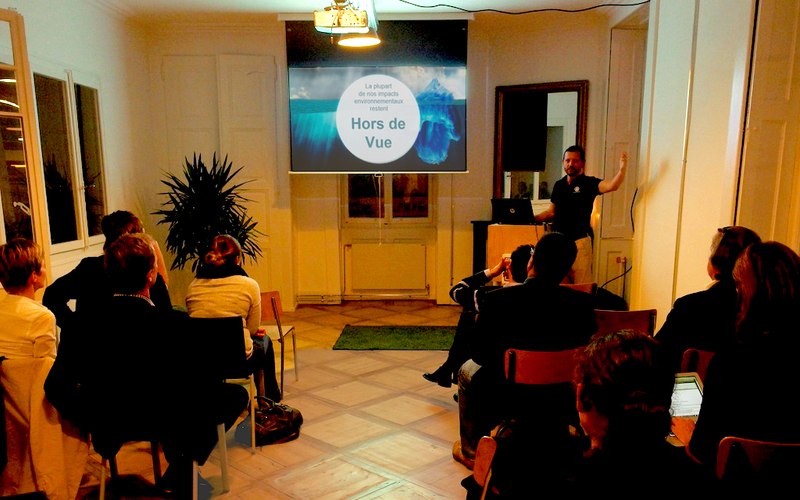 My Drop in the Oceans’ inauguration event for local businesses in Geneva was strategically held at Impact Hub Geneva, one of MyDIO’s first partner businesses. Impact Hub Geneva is an innovation lab, business incubator and a social enterprise community centre in the heart of the city. Part of a global network connecting more than 7000 entrepreneurs and facilitating opportunities for social impact, Impact Hub’s vision and inspirational spaces seemed a natural setting for My Drop in the Oceans. The aim of the event was to demonstrate some of the platform’s functionality, vision, and communicate the value potential for businesses. David French, Founder of My Drop in the Oceans presented the innovative platform which was launched this September in collaboration with the State of Geneva. The Platform’s vision is driven by the need for awareness of negative environmental impacts caused by human activities, the recognition that businesses all too often find little or no reward for meaningful investments into sustainable development while consumers are not truly empowered to keep on making the right choices. My Drop in the Oceans has been created to abate hidden environmental costs from the consumption chain through a complimentary currency called DIO, designed specifically to reward businesses and individuals for their eco-conscious behaviour therby returning value to nature. The platform is currently at a very exciting stage. After its launch, My Drop in the Oceans has been engaging individuals across shopping centres in Geneva to sign up for their MyDIO account. This is in collaboration with the State of Geneva’s campaign “Le Tri c’est Chic”,distributing designer bags “Sakatri” to increase the level of recycling across the Canton. Related to the city’s current recycling rate of 45%, upon signing up for a MyDIO account, Geneva citizens receive a dividend equivalent to 45CHF to spend at partner businesses. In order to receive more DIO credits, individuals are invited to post pictures of their Sakatri in use or complete the Global Footprint Network Calculator, allowing them to learn how much of the earth’s surface is needed to sustain their lifestyle. In parallel, a growing number of partner businesses of every type and size has been signing up to the platform from trendy cafes and restaurants, to beautiful equitable fashion boutiques, yoga centres, musical instrument shops, sustainable designer diaper and potted plant businesses. These partners are now allowing a rate of 5% of their product prices to be paid in DIO by MyDIO account holders. My Drop in the Oceans envisages that by the end of 2014, 50 new businesses will be partners on the platform. As well as supporting the concept of rewarding eco-conscious behaviour, these partners can enjoy increased visibility, promotion and loyalty through the MyDIO platform and social networks. At the same time, My Drop in the Oceans allows businesses to feel part of a multi-stakeholder movement for nature. In addition, My Drop in the Oceans is currently in discussions with Washington DC and Nairobi about bringing the Platform to their respective cities. Sign up for your MyDIO individual or Business account. Tell your friends and favourite businesses, help spread the word. Log into your account, begin taking action and be rewarded with more DIO. Post a picture of your Sakatri when disposing of your recycled waste and earn 50 DIO Rewards. Complete the Global Footprint Calculator and earn 100 DIO Rewards. Share YourDIO stories on our Facebook and twitter pages.